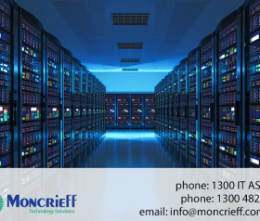 Moncrieff Technology Solutions are proud to announce the launch of a next-generation hybrid cloud solution that offers the agility and flexibility your business needs. Run on secure IBM and Cisco technologies (VersaStack) and physically located in WA, the hybrid cloud is a stable, reliable solution that offers businesses flexibility with no need for direct investment in IT infrastructure. Deployed in mid-2016, several Moncrieff clients are taking advantage of the hybrid cloud to run day-to-day applications. An additional benefit of the hybrid cloud is the capacity to run test environments with no impact on other applications. A key element of the Moncrieff hybrid cloud is the abstraction of hardware and software elements into programmable tasks; this enables automated workflows to your organisation that reduces risk while enhancing agility and innovation. Using Infrastructure as a Service (IaaS) through Moncrieff’s hybrid cloud drives profitability and adaptability in your organisation to support your current environment and future growth.